Take dinner from dull to delicious when you make our Roasted Winter Vegetable Trio. 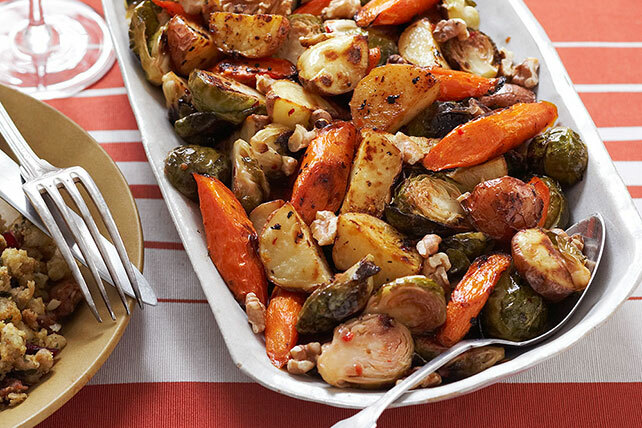 With Brussels sprouts, carrots and potatoes tossed in a zesty dressing, this Roasted Winter Vegetable Trio recipe is a seasonal favorite. Toss vegetables with dressing and crushed pepper; spread onto rimmed baking sheet. Stir in nuts. Bake 20 min. or until potatoes are tender. Prepare using KRAFT Lite Zesty Italian Dressing. Small, bright green Brussels sprouts with compact heads will be more tender than larger ones. They are available late August through March. Cook 4 slices OSCAR MAYER Bacon. Crumble over roasted vegetables before serving.